In the shades of evening lectures the Drop Shadow Talks present projects influenced and inspired by the inerplay of art and user interface. At Berliner Technische Kunsthochschule in the semester of 2009 I had the chance to start a lecture series that brings together artists, theorists and designers in the digital drop shadow. The series continues this semester. The digital drop shadow is the most popular effect in computer graphics today. Easily applied, it made its way to modern graphic design and advertising. It raises typography and objects from a flattened background into three-dimensionality—and thus significance. With the current generation of operating systems the drop shadow effect entered the graphical user interface to a new extent. In this context it raises not only windows from background wallpapers; it also stands for a visually enriched interface that strives towards three-dimensionality. Loaded with rich imagery, photorealistic icons and pseudo three-dimensional configurations the graphical user interface yet remains tied to its flat medium. Bewildered by this paradox, the graphical user interface leaves the office it was made for and becomes a pop culture phenomenon. The Drop Shadow Talks reply to current developments on the visually enriched layer for machine interaction. In the shades of evening lectures the Drop Shadow Talks regularly present art and projects influenced and inspired by the baroque graphical user interface. The Drop Shadow Talks take place at Berliner Technische Kunsthochschule. 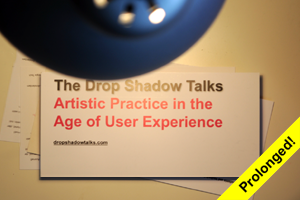 Vimeo channel and website of the Drop Shadow Talks.